Dropbox is unloading a number of additional services today, and one on its docket follows the photos-focused trend sweeping the tech world. 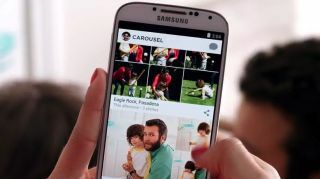 Carousel is a new app anchored on storing, organizing and sharing photos and videos. It's available in the Apple App Store and Google Play right now. "The gallery for Dropbox" automatically stores and organizes pictures and vids from your phone's camera. Images are arranged by day, month and year, so photos from the hike you went on Dec. 17, 2013 are kept separate from a video of you blowing out your birthday candles on March 1, 2014. A wheel on the bottom lets you swipe through the illustrated timeline of your life. Once photos and videos are captured, they are automatically backed up on Dropbox. TechRadar's own test found users will need a Dropbox account to access the app, which is none too surprising. Somewhat annoyingly, those you share your images with will need the app to view them fully or do anything with them as well. Users can share photos privately with friends by swiping up on a single image. Armed with a name, email or phone number, users can send one or more photos their friends' ways. There's also an option to share an entire event by tapping on the share icon in the top right-hand corner of a collection of snapshots. For items that are sent to you, there's an option to keep them in your own Carousel. While the app is sleek and could pose a formidable rivals like Instagram Direct, how receptive consumers are to yet another way to organize and share their precious memories remains to be seen. Was Dropbox affected by the Heartbleed bug?